We can convert, adapt or modify for passenger carrying or wheelchair access no matter how big or small. The Ford Transit base vehicle is provided with a 3 year Ford warranty. 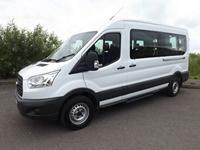 Minibus leasing, long term hire and minibus contract hire options (with or without servicing) are available on this Ford Transit 15 Seat Minibus.